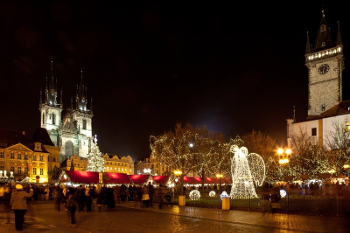 Enjoy Prague’s Christmas markets, one of the most beautiful in Europe! The time of Advent and Christmas has special magical powers, especially in the historic centre of Prague, where carols mingle with the aroma of punch and mulled wine. Allow yourself to be enticed by the rich Christmas programme, glittering atmosphere, typical Advent delicacies, and traditional Czech nativity scenes! The Christmas market on Old Town Square honors tradition. It lasts from the beginning of December to the beginning of January and you’ll find everything you’d expect during the Advent period: a Christmas village with red-roofed huts selling Christmas decorations, traditional handicraft products and small gifts, a children’s workshop for busy hands, a massive tree covered in fairy-lights, a rich program of Christmas events and hearty Christmas food. Celebrate Advent in richly decorated streets with masses of Christmas decorations, mulled wine, Christmas confectionery and roasted chestnuts. Like in other Christmas markets in Europe, visitors can also take away an interesting souvenir in the form of a special mulled wine mug that you can take away with you as a memento of your visit to Prague. 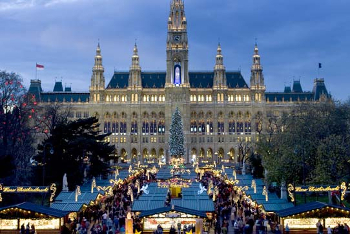 At the traditional Vienna Magic of Advent, the Rathausplatz becomes a shining fairy-tale land. The 150 or so sales stands offer Christmas gifts, Christmas tree decorations, sweets and warming drinks. The trees of the surrounding City Hall park are festively decorated and radiate in a sea of lights. There are lots of offers here for children in particular. Dresden's Chris­tmas Market is traditionally called Striezelmarkt, it is Germany's oldest Christmas Market with a very long history dating back to 1434. The Market is located on the Altmarkt Square, in the historical city center. The traditional Dresden Christmas Market with its romantic and festive charm is an inspiration in itself, a real treasure trove for real traditional hand made crafts. Every visitor here will find a “little something”: Christmas pyramids, smoking figures and candle holders from Erzgebirge Mountains, indigo-dyed printed textile products and pottery from Lusatia, gingerbread from Pulsnitz, filigree lace products from Plauen, Herrenhut Advent stars, blown glass tree decorations from Lauscha, and of course specialities from Dresden itself, such as the traditional ‘Pflaumentoffel’, a chimney-sweep figure made of dried prunes. Visitors can also watch the carvers, glass-blowers and bakers in action at the crafts market. 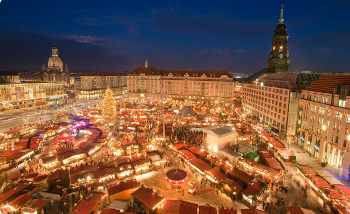 The focal point of the Dresden Christmas Market is the world's tallest Christmas pyramid, with a height of 14 meters and the world's biggest nut cracker. The culinary attraction of the market, however, is the Dresden Christstollen, originally known as ‘Striezel’, which accounts for the market’s name. Experience a traditional Christmas City with its world-famous Christkindlesmarkt and dive into the one-of-a-kind atmosphere of the festively decorated Old Town of Nuremberg. The local markets are famous for its beauty, traditions and atmosphere. The aroma of mulled wine, roasted almonds, sausages and gingerbread permeates the air. The local children´s choirs adds to the beautiful experience. 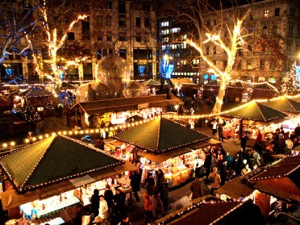 There is also the family friendly Children's Chris­tmas Market on Hans-Sachs-Platz, with its special programs for children. Budapest is a popular European stop off all year round, but even more so at Christmas time as the city gets festive with traditional wooden stalls lining Vörösmarty Square. More than 100 wooden pavilions, which will attract visitors with their unique high quality folklore and applied arts products, will be built on the square. Christmas decorations, small presents, candles, gloves, woollen hats, wrought iron and woven products are also sold here, as well as other special articles that cannot be found anywhere else.